Built and operated by the Corporation of Trinity House from 1803 to 1988, the fine buildings over a 185 year period were used to train lighthouse keepers and to repair and maintain lightships, seamarks and buoyage along the Thames from London to the Suffolk and Kent coasts. More recently turned into a centre for art, culture, maritime history, education and creative businesses, the wharf acts as a beacon within the local community whilst spreading art and culture far and wide. 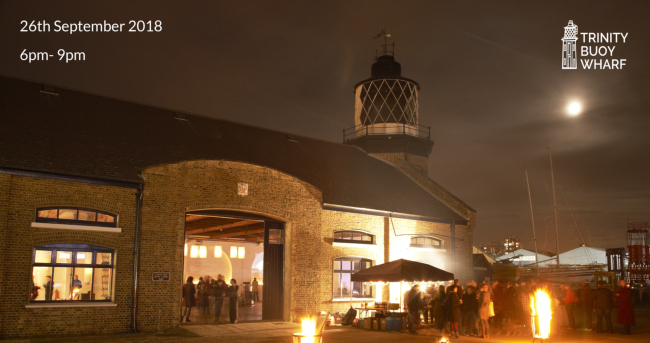 The rich maritime history of Trinity Buoy Wharf; its buildings, lighthouse and the Thames, River Lee and their banks nearby will be celebrated on the night with specially installed light projections, art shows, films, images, stories and guided tours. The evening's events include the private view of the Trinity Buoy Wharf Drawing Prize (previously the Jerwood Prize) and the premier of Rupert Murray's film on the current use of the site and its many tenants. Trinity Buoy Wharf's history and anniversary stories will be on show in the Story Box. Between 6pm and 9pm there will be a host of activities taking place in the buildings and in the open air around the site.